One of the challenges of working with I2C (aka “two-wire” or “TWI” or “Wire”) devices is knowing the I2C address of the device. Older devices have a fixed address, or a “choose one-of-four” approach. But newer I2C devices have fully programmable addresses, leading to cases of not knowing what address a device is at. 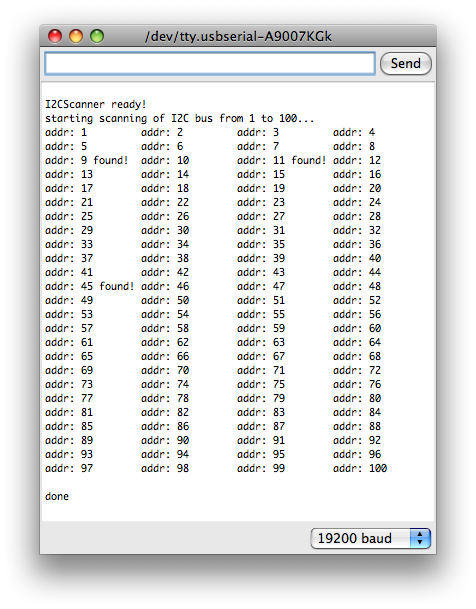 Fortunately, there’s a technique one can use to “scan” an I2C bus and determine these addresses. Conceptually it’s very similar to a network “ping”. 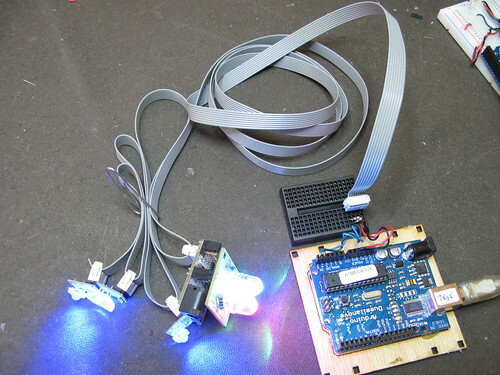 Below is an Arduino sketch “I2CScanner.pde” that turns an Arduino into an I2C bus scanner. When loaded up on an Arduino, the sketch will immediately scan the I2C network, showing which addresses are responding. For example, the above output is from an I2C bus with four slave devices on it (one BlinkM MaxM, three regular BlinkMs). One thing to notice about the I2CScanner output is that although there are four devices on the bus, only three addresses were detected. This is because unlike IP networks and “ping”, you can’t tell if two devices have the same address. They’ll both respond to commands sent to them just fine, you just can’t read back data from them. In I2C, the first byte transmitted/written by the master to a slave is the address of the slave. If there is a slave at that address, the slave will signal the I2C bus, otherwise it leaves it alone. We can use this to implement a bus scanner. In the I2CScanner sketch, this function is extended a bit to support a callback function. The callback function is called with the result of every address scan. In I2CScanner, this callback function is called “scanFunc()” and just prints out “found!” or nothing, but it could be modified to do more complex tasks like doing additional I2C transactions to figure out what kind of device it is, or setting all the devices to a known state, etc. I don’t think I’ve seen any Serial examples that check for a specific number of bytes available. It’s really handy. This sort of functionality would be great in a library I think. Maybe not in Serial, but a core class. Any other protocols people like to use and the Arduino code they use to do it? Like me, you may have a few old Arduino boards or ATmega8 chips (in the boards) laying around from when you were first playing with Arduino. 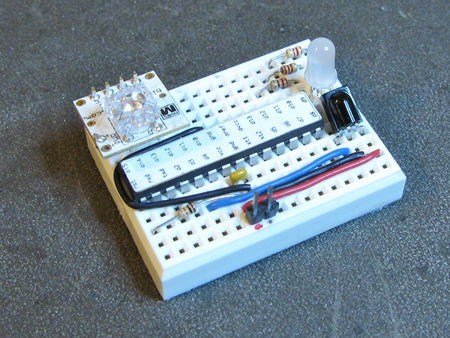 Those chips can still be really useful as the heart of a tiny “Minimal Arduino” setup. Here’s a really quick 3D model of BlinkM, if anyone needs it. It’s accurate to ~0.1mm. 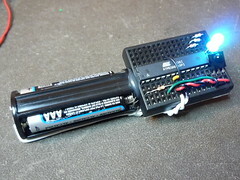 And here it is plugged into the awesomely done Arduino Diecimila model by Jon-Paul from the Google 3D Warehouse. 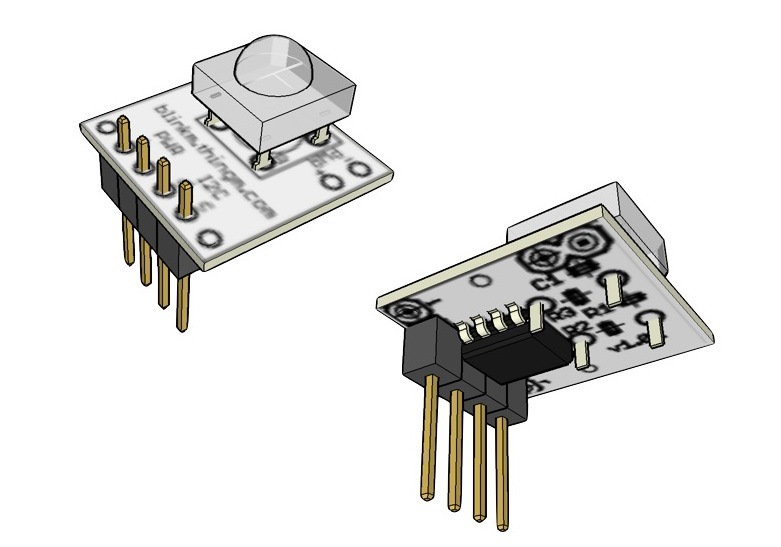 SketchUp is pretty great, but I found a problem with it if you’re trying to make accurate to-scale electronic parts: it won’t create surfaces with an area of <1mm. Took me a while to figure that out. The solution is to make a 10x or 100x size version and then do a scale by 0.1 or 0.01 when you’re done. Arduino makes it pretty easy to store & use character strings, but those strings compete with your variables, so you can’t do as much. Here’s how to put big strings into read-only program memory and use them. char hellostr =  "<html><head><title>hello world</title></head>"
The problem with this is that “hellostr” is stored in RAM along with your variables. The ATmega chip in Arduino only has 1kB of RAM. If your code is getting complex, and you’re using big strings, and lots of libraries, you may start having mysterious problems. Arduino can’t warn you if your sketch starts using too much RAM. Instead, you can use PROGMEM, or PROGram MEMory, to store your strings. That is, the flash ROM memory that your code lives in. Using PROGMEM strings can be tricky, but here’s a little function called “printProgStr()” to make it almost as easy. If you have another use for the string that isn’t “Serial.print()”, just create your own function and put whatever per-character handling function in there instead. 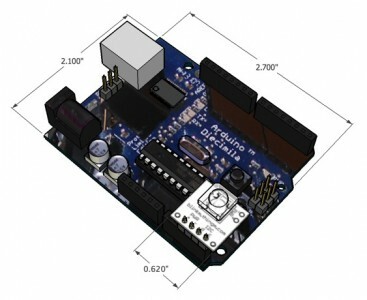 Mark Allen, instigator of Machine Project, is holding an Intro to Arduino class in a few days. It’s called “Intro to Microcontrollers with Arduino“. It will cover many of the same topics covered in my previous Spooky Arduino and Bionic Arduino courses. So if you’re near L.A. and want to have some fun programming computers the size of your finger, sign up now! Machine Project classes usually sell out in a day or so.